A great budget hotel...!!! ... Position very nearby Metro. Bus and Hop on - Hop off stations. Nice bar and restaurant in the hotel. Availability and courtesy of staff/owners. 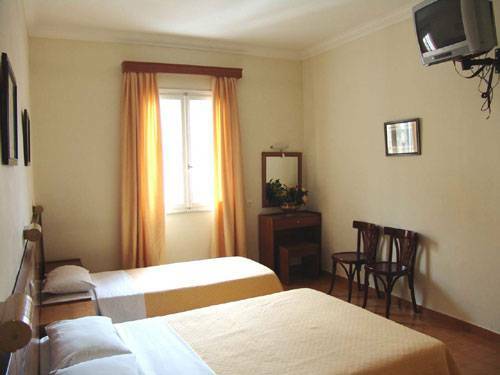 The Hotel Rio Athens, 3 stars, is a first class property strategically located 25 kilometres away from the El. Venizelos Intl. Airport. The hotel is situated in the center of Athens, within walking distance to all local attractions, on the quiet pedestrian street of the Karaiskaki Square, next the subway station "METAXOURGHIO" and quite near from the international railway station. It is 5 minutes away from the Syntagma sqr, 25 minutes by bus or train from the airport and 15 minutes from the port of PIREAUS by subway. This is a beautiful neoclassical building entirely restored, blending every modern convenience with the classical aesthetic. Hotel Rio Athens is highly recommended in many international tourist guide books around the world not only for holiday stays or short breaks but also for business trips, makes this hotel the ideal choice for both business and leisure travellers. Each of the spacious and tastefully appointed guest rooms are welcoming and fitted out with air conditioning, personal bath or shower, satellite TV, mini bar, hair dryer and direct dial phone with the aim of your complete comfort. 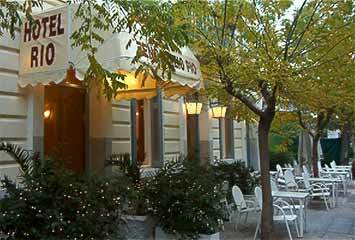 Charming, modern café-bistro called Rio cafféat the ground floor, serving the best espresso and cappuccino in the area, for tourists and locals, which is situated in a great central location. 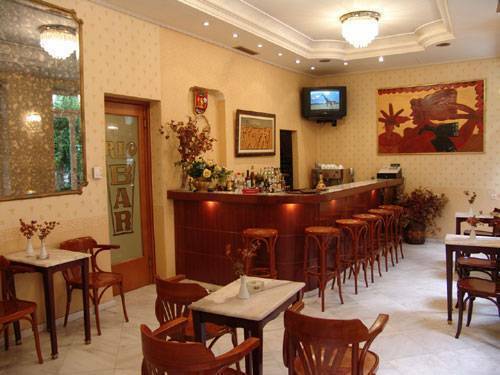 In the Rio caffé you can enjoy a quick snack and a friendly chat over a cup of coffee with tasty snacks. It is the perfect spot for a cool drink and a delicious Greek meal with the beautiful view of the fountain at the Metaxourghio square, this is a meeting point for people who live a contemporary life. The HR- Bar-Restaurant and music club, open all year around, is the ideal place to relax under the candle lights, enjoying drinks, Greek and Italian food and pleasant music until well after midnight. 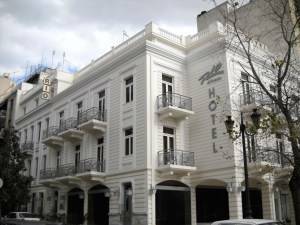 Hotel Rio Athens is walking distance from the Acropolis, the Parthenon, the old town Plaka, Psiri (the night life area), the National Archeological Museum, the European railway station, the flea market and the big shopping area in Ermou street. 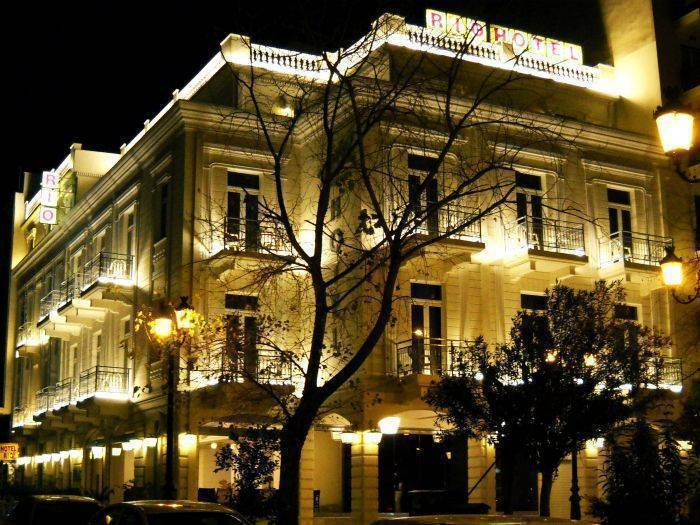 "Hotel Rio Athens is walking distance from the Acropolis, the Parthenon, the old town Plaka, Psiri (the night life area), the National Archeological Museum, the European railway station, the flea market and the big shopping area in Ermou street. Charming, modern café-bistro called Rio cafféat the ground floor, serving the best espresso and cappuccino in the area, for tourists and locals, which is situated in a great central location. 72 hours before arrival /No refunds will be made for no-shows or early checkouts.